Today, I am going to do a pic-tutorial showing you show I create machine embroidery applique quilt blocks. I will take you through this step by step. Hoop the stabilizer in a large hoop. Draw a big square onto the stabilizer with the Elmer’s glue stick. Take a square piece of fabric about an inch or two larger than you would like your finished quilt block and fold the fabric so that it lines up with the center marks on the embroidery hoop. Work quickly as the glue dries very fast. If the glue gets dry before you get things lined up, just add more glue. Then lay the fabric flat and make sure it is nice and smooth with no wrinkles. The next step is to attach the hoop to your embroidery machine and stitch the first die line. 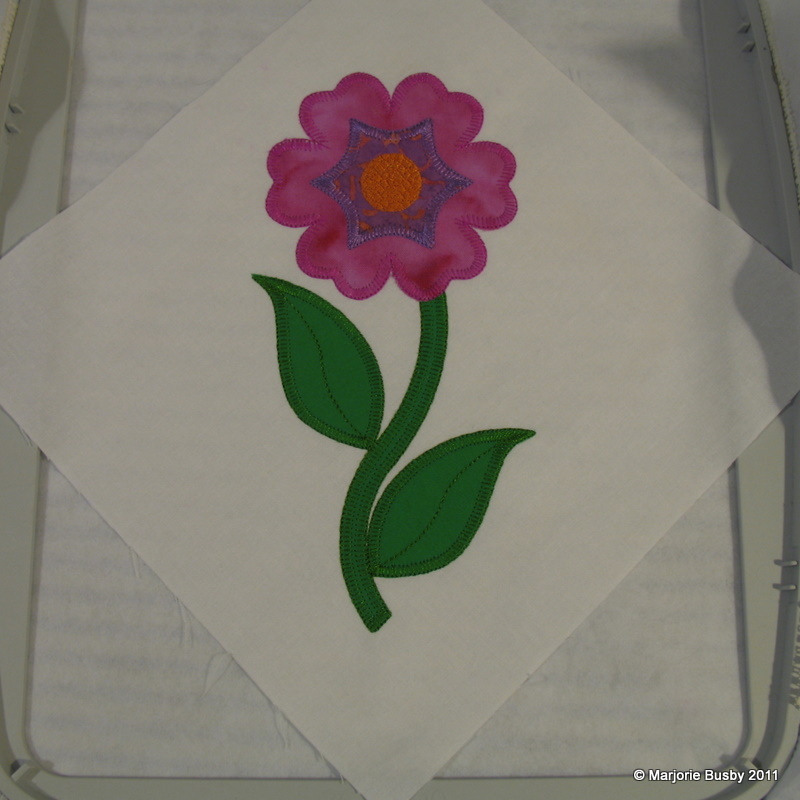 This is a Round Flower stem and the embroidery has been modified to be shorter so that it will fit an 8 inch finished quilt block. Stitch die line for the leaves. Press the stem and leaves inside the die line. 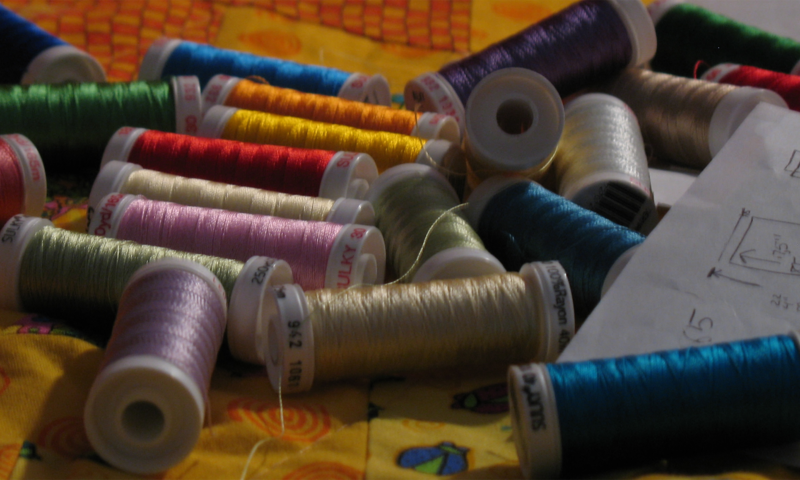 It is important to keep the fabric just inside the die line or on the die line. You can see in this photo that the fabric is just inside the die line. If the fabric is over the die line, you will see fabric outside the embroidery and frayed fabric peeking from underneath the edge of the embroidery stitches. This is the beauty of die cuts – you don’t have to have frayed fabric sticking out from under the applique stitches. Can you see that I cut the stem off a little shorter so that the block will be smaller? The next step is to put the hoop back onto the machine and stitch the stem and leaves. The next step is to change the thread color and stitch the die line for the flower. Stitch the die line for the flower. Remove the hoop from the machine and fuse the flower to the background fabric using your mini-iron. Re-attach the hoop to the machine and stitch around the flower, then change the thread color and stitch the die line for the center. Remove the hoop and fuse the center to the round flower. Stitch the middle center with an applique stitch, then change thread colors and stitch the round center, and the embroidery is complete. You can now gently lift the background fabric away from the stabilizer – the glue releases very easily – and trim away the stabilizer. Square up your quilt block to 8 1/2 inches and it is ready to use in a quilt. I like your technique. Now’s the time to stock up on glue. I can’t wait to get home and give it a try. I’ll bet the checkout lady at the grocery store wonders what I do with so much glue – LOL! Excellent tutorial and beautiful machine embroidery design too!